It's good to listen to Najib Razak condemning the Zionist regime over their latest atrocities in Gaza and their audacity to defend the action as being in the interest of Israeli security. I hope the Prime Minister takes it further and all the way. Just take the cue from his predecessor's predecessor. Together with Dr Mahathir Mohamad (who's known for his uncompromising stance on regimes that support Zionism while he was PM and even after) and politicians linked to Anwar Ibrahim (who isn't known for the same thing, unfortunately, but do read Malaysian leaders unite over Gaza, 10 July 2014, anyway ..), the Malaysian leader can make the voice of Malaysia and human beings in general be heard against the evil that has been blatantly committing crime against humanity in Gaza. All talk. Same situation keeps repeating. No answers. Both sides need a different approach if they really want peace but neither side does. A waste of energy and effort for the rest of the world. Let them carry on at each other for all eternity, if they aren't prepared to seek peace themselves. 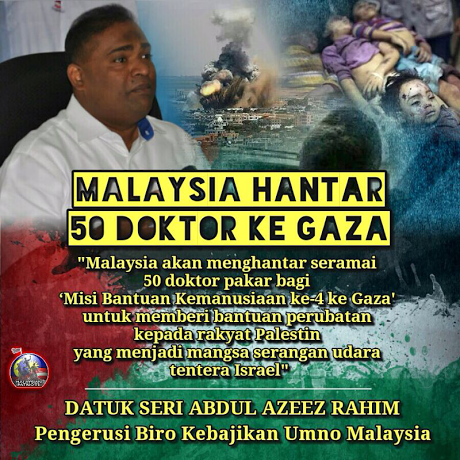 Who in Malaysia has the guts to tell the US government to stop it's blind support of Israel? Tun Dr Mahathir? The US will dismiss him contemptuously as a politician of no consequence. The OIC? They are split within themselves about Israel. Iran is the arch-enemy of Israel. Iran is also a Shi'ite power. Malaysia doesn't do business with Shi'ites. In Asia, China, India and Japan have no problems maintaining cordial diplomatic relations with Israel. The plight of the Palestinians is not a major cause celebre in these countries. Realpolitik is a b***h, isn't it? This talk only egregious Mahathir not only have so much money hidden away as the richest man in Asia. Yet he has not come up even with one cent of his fortune for the Palestine. Please do, after all very soon they would mean nothing to you and you call yourself a muslim. You were the PM for 23 years, why didn't you break off relationship with the countries that maintain relationship with Israel ? As usual always talks and no actions, empty ballon makes the most noise ! Nak Jaga Sempadan Sendiri pun Tak Mampu..Tiap Tiap Bulan Ada yang kena bunuh..Kena Colek... Berangan Nak Lawan Israel!! The NGO I-Medik is already sending a group of 5 specialists over to Gaza. IIRC, they'll be leaving this Friday 18th July, along with 4 reporters and an officer from Aman Palestine. Let's applaud them for their courage, and pray for their safety always. Allah is Great. Syria's Assad killing his own fellow muslim citizens... semua takde bising-bising kecoh-heboh pon! Why are the Shite muslims in Malaysia are being outlawed, just like criminals, and also being persecuted ? Or are these Shite muslims in Malaysia different from the Shite muslims who are Hamas are also known to be Shites and so are their arms and their rockets suppliers from Iran are also known to be Shites. If they are the same why are they being treated so differently in Malaysia ? The Shites and the Sunni muslims in Iraq are killing each other, will someone try to explain to me the differences ! The principal owners of Fuelsubs are businessman Habibul Rahman Kadir Shah and Datuk Razali Merican Naina Merican, who is the brother to Kepala Batas MP Datuk Reezal Merican Naina Merican. Habibul, who is close to Umno and the Prime Minister's Office, sits on the board of several companies, including Group Lotus PLC, which is owned by Proton Bhd, Felda Global Venture Bhd's Twin River Technologies Holdings Inc, and in March, was named to the board of the London-based Petronas Energy Trading Limited. The other owners of Fuelsub are HKS Primatrix Sdn Bhd, which is also owned by Habibul, and his brother Zaid Kadershah, a telecommunications senior executive. Their presence in the project is said to be causing disquiet among some quarters in Umno and pro-government bloggers, who called for transparency in the project to plug leaks in the subsidy programme. Al-Qaeda in the Islamic Maghreb (AQIM) said ISIS's June 29 declaration of a cross-border Islamic caliphate in Iraq and Syria has "defects" and restated its loyalty to Al-Qaeda leadership, which previously disowned ISIS for being TOO EXTREME EVEN FOR THEM. For instance, ISIS spokesman Abu Mohammed al-Adnani criticized Al Qaeda’s Ayman Mohammed Rabie al-Zawahiri for fragmenting jihadi groups and called for the head of Al-Qaeda’s official Syrian affiliate, Jabhat al-Nusra, to be fired. Zawakiri, meanwhile, has repeatedly asked ISIS to leave Syria and stop fighting with al-Nusra. Zawakiri's pleas have been ignored and ISIS and AL-NUSRA have clashed in a series of increasingly bloody encounters in Syria. The extremist groups have even been launching suicide attacks AGAINST EACH OTHER, although both are Sunni Muslim groups that are militantly opposed to Syrian President Bashar al-Assad. Sibuk dengan Israel, Kapalterbang negara sendiri kena tembak mush tak kisah! Bodoh ke?